Despite consuming copious amounts of food as depicted in previous posts, I’ve been exercising very regularly. Here in Aruba, I stop by the gym along L.G. Smith Boulevard, that has one heck of a view from the treadmills and elliptical training machines. Take a look. 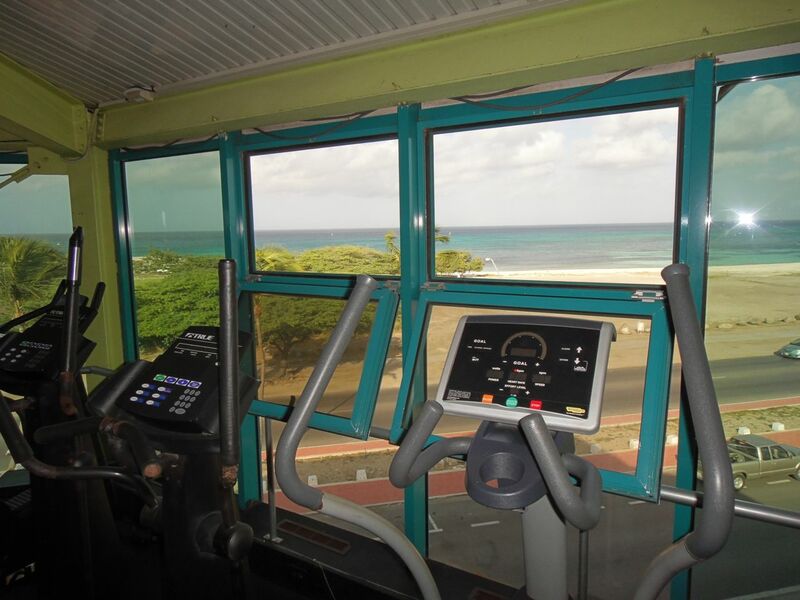 View from the gym in Aruba. Yeah, that’s the Caribbean out there with a little stretch of beach. The only thing is, you can’t allow yourself to be distracted while you’re working out. The crystal blue water will do that from time to time. At any rate, I’m enjoying the exercise, keeping the belly to reasonable proportions, and generally improving my health. Be well and bon dia from Aruba. aaarrggghh!! missing Aruba! can’t get there this year; maybe next year … or later this year is another choice. Enjoy!